Maybe you’ve felt it on a cold winter night, nestled by a crackling fire, or maybe it’s sitting around a kitchen table with friends as comfortable as your broken-in pair of shoes. Defined as “a quality of coziness and comfortable conviviality that engenders a feeling of contentment,” there’s no direct English translation for this Danish buzzword, which we also wrote about just last month. But one visit to the charming new Oat Bakery can provide a clear understanding. “In Denmark, there is such a culture around bakeries, and that’s what we want to create here,” explained co-owner Louise Ulrich of her blooming business, which was inspired by the nutritionally dense and delicious bread baked by her mother, Else Ulrich, while growing up in Denmark. Walking into the unassuming bakery on West Haley Street, I was greeted by the scent of fresh bread, piles of buns speckled with seeds and grains, and a warm welcome from Louise Ulrich, her husband/co-owner, Lou Fontana, and even Else herself, who was in town for Thanksgiving. 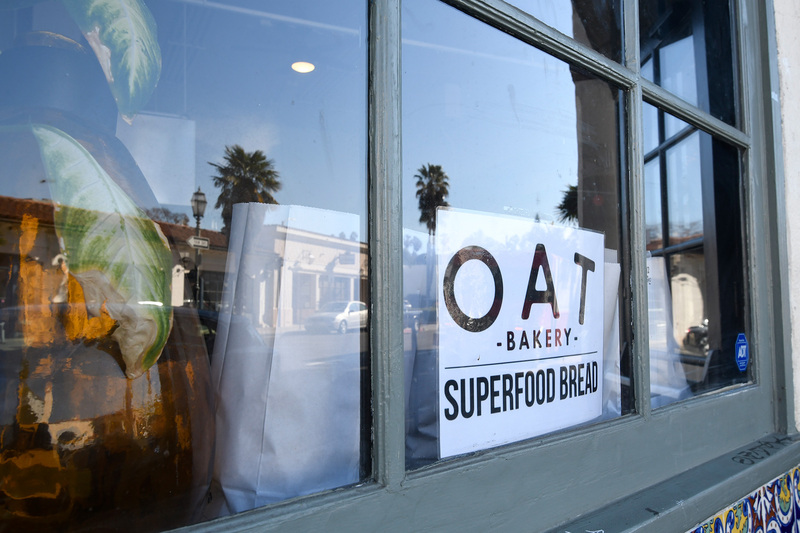 In addition to their retail shop, Oat Bakery bread is now for sale at the farmers’ market, Montecito Village Grocery, and The Honey B. “She created a recipe that’s much healthier than all the other breads,” Fontana explained of Else’s creation, which she designed to nourish herself as a marathon runner in a way that optimized both nutrition and taste. 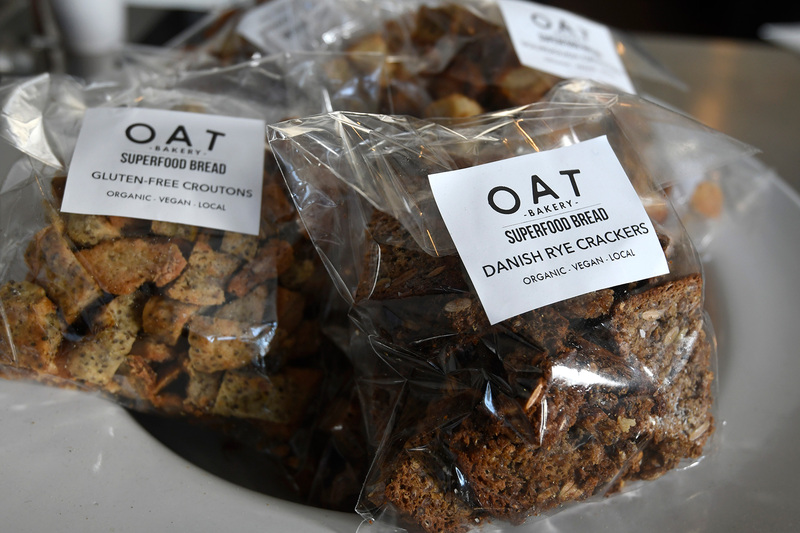 “We use all-organic flour and whole grains,” Fontana said of their vegan-based breads rich in protein, oils, nuts, and fibers — there’s a gluten-free version as well. A rainbow of colors, flavors, and textures fill each bun with seasonal ingredients, such as butternut squash in winter and heirloom tomatoes in summer. Other combinations include sage-garlic and shiitake-mushroom-shallot. I sampled the turmeric-pumpkin-seed-feta and the spinach-pomegranate-goat-cheese buns; each blew me away with its perfectly crisp crust and tender, doughy center. The buns can easily be enjoyed as is, but Oat’s vegan and gluten-free almond cilantro pesto, roasted carrot and jalapeño hummus, and garlic aioli spreads are delicious additions. At the end of our chat, I was reluctant to leave the comforting little bakery. But with a happy belly, a hug from Else, and a brown bag piled high with fresh loaves, I brought a little of that hygge home. Oat Bakery is located at 5 West Haley Street. Call (805) 335-1628 or visit its website.